GSP AUDIT 2017-2018 WAS CONDUCTED FROM JULY’17 TO OCTOBER’17. THE AIM OF THE AUDIT WAS TO SENSITISE THE STUDENTS TOWARDS THE ENVIRONMENTAL ISSUES IN THE AREAS CONCERNED TO AIR, WATER, LAND, FOOD, ENERGY AND WASTE. THE HABIT OF SAVING AND USING THE NATURAL RESOURCES WISELY WAS INCULCATED IN THE STUDENTS BY MAKING THE STUDENTS CARRY OUT THE AUDIT ACTIVITIES ON THEIR OWN. STUDENTS LEARNT TO TAKE CARE OF THE ENVIRONMENT AND SAVE THE EARTH FOR THE COMING GENERATIONS. ALL THE EFFORTS DONE ARE TO MAKE THIS WORLD A BETTER PLACE TO LIVE IN. WE ARE AT THE POINT IN HUMAN HISTORY WHEN OUR POPULATION IS RAPIDLY EXPANDING AND OUR RESOURCES ARE BEING EXHAUSTED. 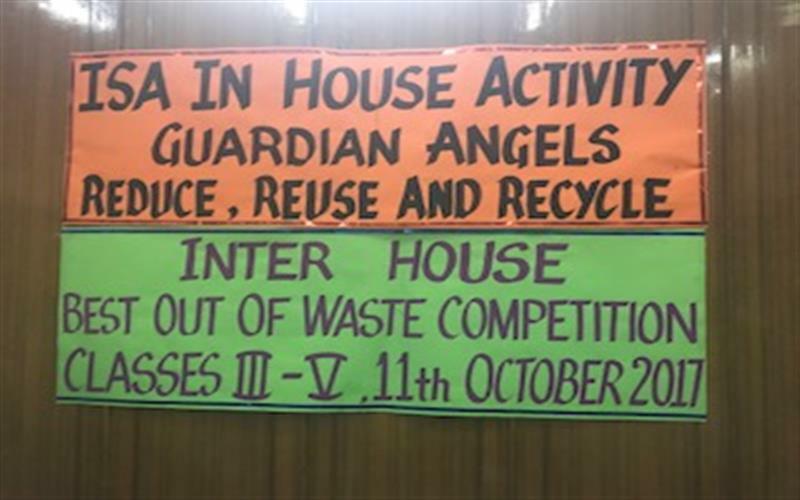 SO AS PART OF THE ISA IN HOUSE ACTIVITY AN INTER-HOUSE COMEDY SHOW COMPETITION WAS ORGANISED HIGHLIGHTING THE THEME OF ISA ACTIVITY- GAURDIAN ANGELS- REDUCE, REUSE AND RECYCLE ON 14TH NOVEMBER 2017. THE PRIME OBJECTIVE OF THE HOUSE ACTIVITY WAS TO INCULCATE AMONG THE STUDENTS THE SENSE OF COLLECTIVE RESPONSIBILITY TOWARDS ENVIRONMENT AND ENCOURAGE A HEALTHY COMPETITION. THE FOUR HOUSES OF SCHOOL REPRESENTED JAPAN, U.K, U.S. AND INDIA TO ENHANCE GLOBAL AWARENESS ON THE CRUCIAL ENVIRONMENTAL ISSUE BUT IN A LIGHTER WAY. THE STUDENTS CONFIDENTLY PLAYED THEIR ROLES AND SUCCESSFULLY SENSITIZED THE AUDIENCE ON APPLYING 3R’S IN LIFE I.E. REDUCE, REUSE AND RECYCLE. IN THE COURSE OF THE ACTIVITY STUDENTS LEARNT HOW THE PEOPLE OF THE OTHER 3 COUNTRIES GREET EACH-OTHER BESIDES GATHERING INFORMATION ABOUT THEIR TECHNIQUES OF MANAGING WASTE. STUDENTS FROM CLASSES III-V PARTICIPATED IN ‘BEST OUT OF WASTE’ INTER HOUSE COMPETITION WAS ORGANIZED AS PART OF IN-HOUSE ISA ACTIVITY – COVERING U.S., U.K., JAPAN AND INDIA TO GIVE IT A GLOBAL EDGE.TO INCULCATE AMONGST YOUNGSTERS THE PRACTICE OF 3R’S – REDUCE, REUSE AND RECYCLE. THEY WERE ASKED TO USE WASTE SUCH AS BOTTLES, BROKEN BANGLES, WASTE PAPERS, RUBBER TUBES, BOTTLES, CANS, STRAW, USED BATTERIES, PENS AND PENCILS, ERASERS, E-WASTE ETC. THE MESSAGE CONVEYED WAS GLOBAL – REDUCE WASTE TO SAVE FUTURE. STUDENTS RESEARCHED ON WASTE TECHNOLOGY IN JAPAN, U.K.,AND U.S. TOO. THEIR CRAFT WORK WAS SHARED WITH THEIR PEER GROUP. The greatest threat to our planet is the belief that someone else will save it. Each and every one of us can make changes in the way we live our lives and become a part of the solution. With this vision, an Eco Club Rally was organized by our school on 31st October, 2017 as part of ISA activity. Around 400 students of class VI, VII and VIII took part in the rally. They covered a few lanes of Punjabi Bagh and sensitized the people on the need to save the environment. They used the global approach focusing on UK, USA, Japan and India, spreading awareness with the help of placards, posters and slogans. The rally was a success and the children along with the teachers encouraged the general public to understand their surroundings and become environment friendly. The message conveyed was that lifestyle today should be Reduce, Reuse and Recycle.